Hey Kiddo, pull up a tree and relax for a bit. So here I am, day four of Lent and wondering what the next few weeks will hold. I’ve talked to friends and the topic of conversation always seems to come around to what will I give up this year. Quite honestly, I gave up giving up stuff a long time ago. I’ve learned over the years that giving up chocolate doesn’t bring me closer to God, it just makes me grouchy and one way or another I end up feeling guilty, either for being grouchy or for giving in to the desperate need for a chocolate fix. Somehow I don’t think a major league forty day guilt trip is the best way for me to approach Lent. I decided on Ash Wednesday night that I would write a letter to God every single day during Lent asking the questions I need to ask, asking him to reveal the graces that he knows I need as opposed the ones I think I want and above all to thank him, no matter how my day has been. My other challenge for these forty days is to go back and read those letters the next morning. Often the letter I’ve written alone in the dim light of my room late in the evening has a very different feel in the full light of day. I started that first night asking for the wisdom and courage to write what needed to be written. Hey, let’s face it, my letters aren’t telling God anything he doesn’t already know. He knows what I need even before the need is apparent to me. But they may reveal a few things I need to know about how I approach my God. God’s anticipation of my needs isn’t a new concept to me but it’s always been sort of an abstract thing. Oh I see it but it’s usually months or years later. Not today. It was a beautiful sunny day, clear blue skies, a brisk March wind blowing and overall a perfect day for a walk down the beach. I was down to the last half-mile of my walk out to Stratford Point, walking over a stretch of rocks roughly the size of footballs when my knee gave out. The next thing I knew I was on my keister on a bunch of very hard rocks. I hauled myself up, happy that only the usual motley crew of seagulls were witness to my less-than-graceful plop. I could’ve stopped there, enjoyed the view and headed back. But no, I got up and kept walking. I made it out on to the Point only to fall again, this time within sight of my chapel. I wasn’t about to go back after coming so far. 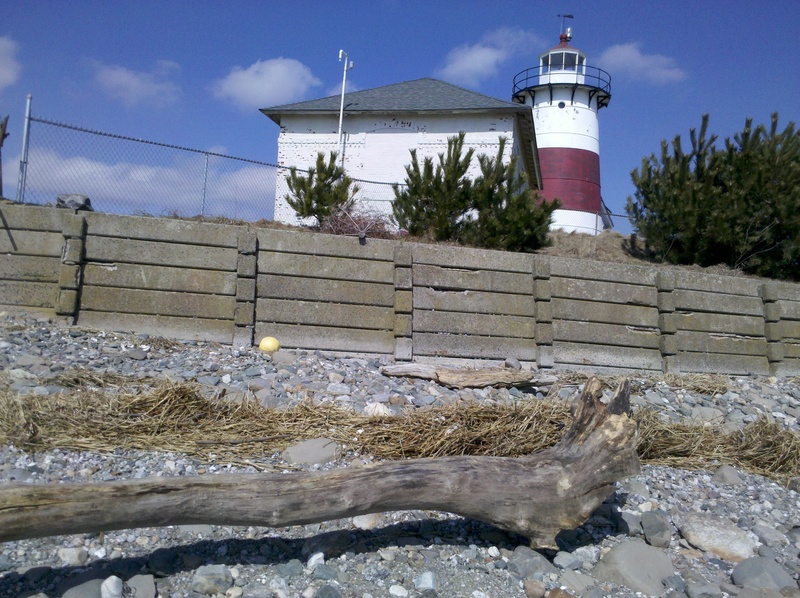 As I rounded the lighthouse, trying to baby my right leg before it decided to mount a full-scale mutiny and dump me squarely on my skull, I discovered a nice-sized tree had washed up at the place I consider my chapel. God had given me a bench much higher and more comfortable than my favorite rock. “Thank you thank you thank you! !” was all I could say and hey, when God gives me a bench, I sit down and shut up. As I soaked up the sun on my face and enjoyed the wind in my hair, I marveled that this tree was dry, perfectly balanced, exactly the height of a chair and facing my favorite view. What were the odds? My need was met before I’d even gotten out of bed this morning. How awesome is that? This morning’s little escapade was a beautiful reassurance that God will have whatever I need ready and waiting for me at the end of my Lenten journey. It was there before I even took one step. I’m really hoping my Lenten journey doesn’t involve falling but if does, I’m know there will be a place to rest waiting for me.